Incident Summary | The Sawmill Fire started on Sunday, April 23rd around 1100 hours MST. It is located about 10 miles SE of Green Valley, Arizona. The cause was first reported as unknown, but there have been speculations that it was human-caused and under investigation. 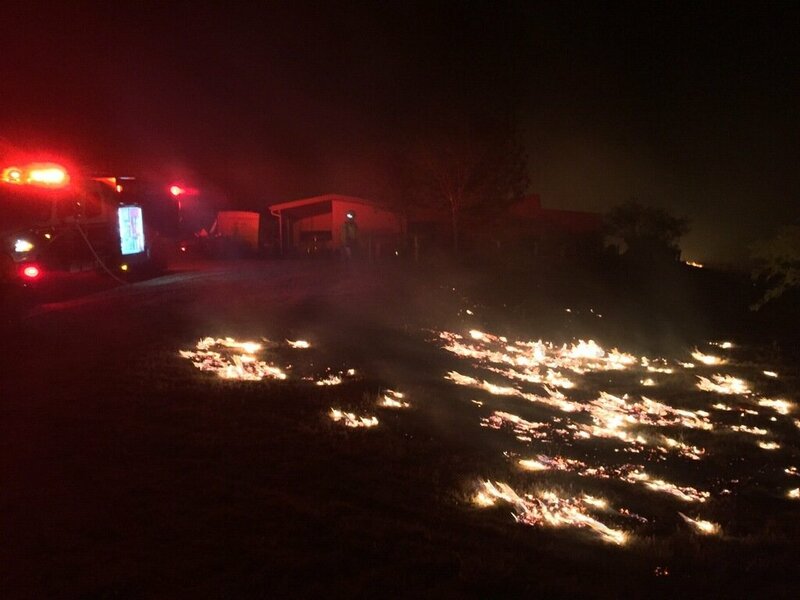 | Update | As of 1455 Hours, Media reports are now saying witnesses reported alleged shooter practiced hitting “exploding targets” that have led up to this wildfire catching drought-like fire fuels ablaze. | Unconfirmed report. Incident Cooperators | USDA Forest Service, American Red Cross – Southern Arizona Chapter, Arizona State Park Patagonia Lake, Bureau of Land Management, Cochise County Sheriff Office, Corona De Tucson FD, Coronado NF, Elephant Head FD, Green Valley Fire District, Helmet Peak Fire, Pima County Sheriff Office, Pima County Office of Emergency Management, Rincon Valley Fire District, Rio Rico Fire District, Santa Cruz County Sheriff Office, Sonoita-Elgin Fire District, Three Points FD, Tubac Fire District, Tucscon Eletric Power and U.S. Border Patrol. Personnel | Staffing has been reduced from 782 down to 617 still assigned to this incident. Fire Behavior | Smoldering and occasional flames were observed as interior islands burned and heavy fuels (cottonwood trees/logs) continued to be consumed. Current Conditions | Potential for fire spread is moderate early in the evening as winds moderate. Potential fire activity will decrease as the night progresses and winds decrease. Personnel | 782 personnel are now assigned to this incident. Showing that resources are slightly showing reduced from the day before. Fire Behavior | Min fire activity today but remains at high risk due to windy conditions. Acreage | 46,991 acres approximately. Based off of Helicopter GPS measurements. Containment | 61% containment status despite high winds. Firefighters are starting to make some progress. Current Conditions | Last night firefighters patrolled along the fire perimeter where pockets of heat h ad been detected. No growth occurred on the fire overnight. Despite high winds and rough terrain, only minor injuries have been reported. Fire personnel will begin to be released due to the successful firefighting efforts. Those that remain will continue with attempts to increase containment numbers and fire patrol. Fire Weather | Winds are expected from 12-17 and later 17-22 mph with gusts up to 30 mph making a big concern for Fire Managers. Meeting Alert | A community meeting will be held on Friday, April 28, 2017, at 1900 hours at Benson School’s Multipurpose Room located at 360 S. Patagonia Street, Benson, Arizona. It will also be live streamed to the Sawmill Fire Information Facebook page. ASL services and captioning will be provided. Staffing | 799 personnel. 16 crews. 67 engines. 5 helicopters. Equipment | All air resources have been grounded for the rest of the day due to windy conditions. Fire Behavior | Active to extreme fire behavior with Red Flag conditions and very low RH. Cost-to-Date | $3,000,000 cost-to-date in fire fighting suppression costs. Command | Type 1 IMT assumed command. Staffing | Approximately 606 personnel. Acreage | About 40,356 from an aerial recon flight over the fire. Weather Concerns | High winds prompting a Red Flag Warning. Evacuations | 200 evacuees from the Sonoita, Hilton Ranch Road and Rain Valley areas. Pre-evacuations near the J-6 Ranch in Mescal. Shelters | Santa Cruz County Fairgrounds (3142 Highway 83, Sonoita, AZ) and the Southeastern Regional Park Shooting Range (11296 S. Harrison Rd. Tucson, AZ). They also serve as evacuation centers for livestock and pets. Resources | 386 crews. 7 helicopters and 3 fixed wing aircraft. A Type 1 IMT will assume command on Thursday, April 27, 2017. Fire Tactics | Continued structure protection of homes, infrastructure, natural and cultural resources. To secure fire perimeter with air resources. Weather | Red Flag Warning remains in effect through this evening for gusty conditions and low relative humidity. Location | Now burning in the Santa Rita Mountains being managed separately by the CNF and AZ DOF. Acreage | 17,000 – 20,000 estimated basis from a visual basis. Cause | Human caused. Under investigation. Command | Miscellaneous overhead personnel along with a Type 2 IMT assuming command. Type 5 IC ordered. Resources | 280 personnel. 6 Hand crews (4 from AZ DOF, 5 Hot Shots from Aravapia, Blue Ridge,and Prescott). plus 3 air tankers type 1, 2 air tankers type 2, 1 Lead Fixed wing, 1 Type 1 helicopter, 1 Type 2 helicopter, 1 Type 3 helicopter, 3 Type 1 crew, 4 Type 2 crew and 2 Type 21A crew. 3 Type 1 engines, 2 Type 3 engines, 7 Type 6 engines, 1 mobile shower, 3 water tenders, 3 overhead team and 2 air attack platforms. Fire Fuels | Tall grass, riparian woodland, mesquite and oak brush, oak woodland and pinyon-juniper. Fire Behavior | Active fire behavior. Fire has crossed over in multiple places over AZ Highway 83. Tactics | In full suppression efforts. Weather | Gusty winds and broken topography have contributed to fire growth. Resources | 300 personnel. A Type 2 Incident Management Team Southwest Area Team 5 will assume command on Tuesday around 1800 Hours. Current IC: Howell, ICT3. Rincon Valley Fire District firefighters are on structure protection during night ops on this wildfire. Resources | 200 personnel, including 20 from the Department of Corrections and 40 from hotshot crews in Payson and Globe — battled the fire Monday near Box Canyon and Santa Rita Ranch. Cause | The blaze was human-caused and is under investigation. He said there have been no arrests. [Green Valley Fire District PIO John Cambra. Fire was reported shortly before noon Sunday and was visible from northern Tucson to south of Green Valley. The cause remained under investigation; there was no lightning in the area at the time. Equipment | 1 Airtanker, 1 Lead, 2 FW Air Tactical, 1 T2 & 1 T3 Helo, 2 T1 IHC, 1 T2 Crew were ordered/assigned today. Several heavy air tankers dropping fire retardant were grounded because of heavy wind. Current Fire Conditions | 7,500 acres. 7% containment status. Continued active fire behavior that is wind-driven. This is due in part to gusty wind conditions and low RH prompting a Red Flag Warning. Evacuations | About a dozen people evacuated Sunday were allowed back in their homes Sunday night and no structures were currently threatened. Future Fire Tactics | Continue to establish secure fire perimeter with aerial and ground resources. Closures | Forest Service Road 62 and Box Canyon Road at Greaterville east of the mountains are closed. Resources | 150 personnel. Unified Command: Arizona Department of Forestry and Fire Management and the US Forest Service. IC: Elliott, AZ DFFM. The Southeast Zone Type 3 Incident Management Team will assume command of the fire at 0700 hours MST on Monday, April 24, 2017. Current Fire Conditions | 2000 acres of grass and brush scorched. Active fire behavior with increased SW winds. 5% containment. Social Media | Hashtags for this wildfire are #SawmillFire C #AzWildfire2017 [so we can track this and all wildfires in each state in 2017].